For sometime I have been talking about the ways that Big Data may just make a big play for small businesses. Ironically, while I have been busy philosophizing about new uses of Big Data, it was only a matter of time before the numbers would need to be brought into play. After all, if we are going to talk about big data for small and midsize organizations, then we should probably use data to validate its use? Today I received some terrific new insights on Big Data in the mid-market as IBM released a new study on the use of data insights and analytics within the midsize organization. 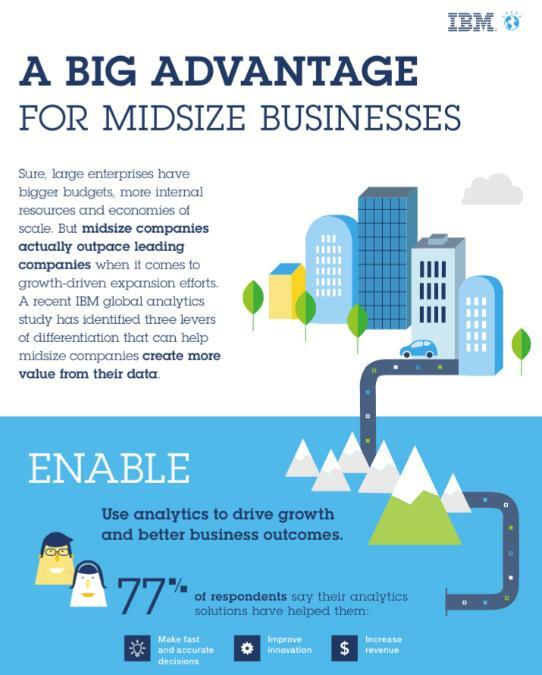 With a new eye catching Infographic (Below) and downloadable white paper, IBM provides simple to see (important given the topic) data on how midsize companies are engaging with data and then using it to make better decisions. Perhaps the best data point of all is that only 40% of what they consider midsize companies are using Data to drive the majority of their business decisions. That means even at the mid-market there is still a strong opportunity for businesses to differentiate by applying the benefits of big data. So even though nearly 4/5th of midsize companies are using analytics, it isn’t actually applied when it comes time to make decisions. The way I see it, data will be the game changer in the future. Question is, how is your small or midsize company looking at applying insights to make better business decisions? Top Image:Creative Commons Via Flickr.